Imagine after a long hard day at work, you can end your day by filling your bathtub to the exact desired temperature and depth by a push of a button. You can also turn water on and off at the bathroom sink with a foot sensor. SMART WATER has many functions that can be performed by just a push of a button. With Dornbracht bathtubs, you can use their app or display switch to automatically fill the tub to your preset desired temperature. The app will also alert you when the tub is full to your desired depth. Dornbracht showers have a unique function where every member of the household can choose their name on the display switch to pick their personalized settings. For example, the memory function lets you turn water off to shave your legs and turn it back on at precisely the same settings, saving water. The Dornbracht sinks can turn water on and off with the foot sensor giving you hands-free control. This feature helps keep your faucets clean from dirty hands. 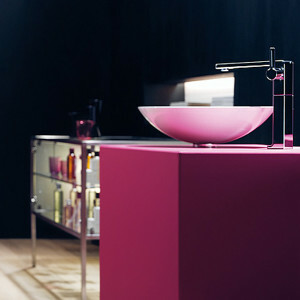 Their washbasins have a memory function that saves water in-between daily bathroom formalities. With also having numerous outlets, like the rotating water outlet or pull-out spray, no separate diverter is needed for the sink, shower or tub. All of these wonder functions are user-friendly. With simple display switch and control knobs there are no complicated menus and easy to work with when your hands are wet – not a touch screen. Dornbracht features also have a ‘Plug ‘n’ play’ installation making it easy to install.